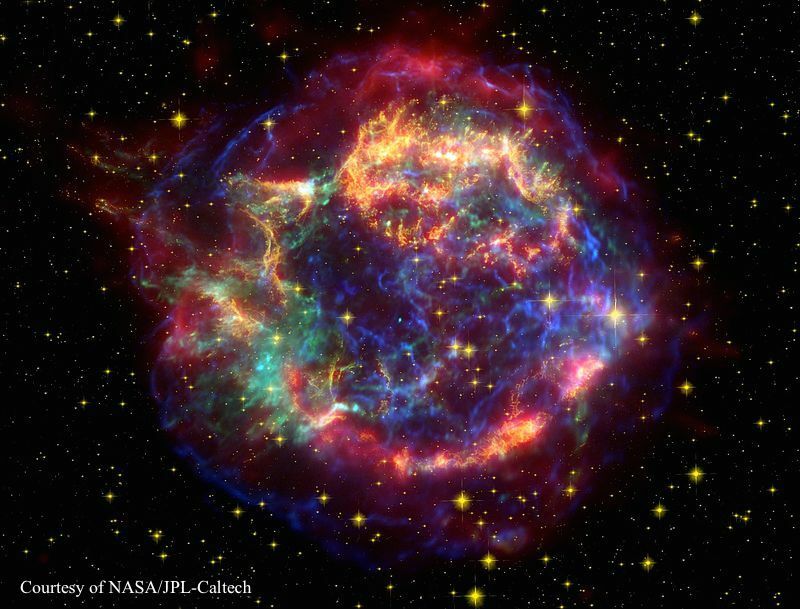 Supernova explosions are one of the most powerful events in the known universe—the violent death of a star. They radiate tremendous energy, outshine entire galaxies, and release elements that make up our physical bodies. Supernovas are also an important birthplace for primordial, “grandparent”, magnetic fields that played a crucial role in the formation of large-scale objects such as our own galaxy. However, the origin of these fields is one of the greatest mysteries facing contemporary astronomers. Supernova Remnant Cassiopeia A. Credit: NASA/JPL-Caltech. Scientists currently believe that magnetic fields did not exist after the Big Bang, but rather were born years later as the universe began to take shape. Cosmic observations have indicated that all matter in the universe is magnetised—from clusters (where galaxies are found) to filaments to voids. One popular theory is that tiny primordial fields were first generated from asymmetrical shockwaves due to misaligned density and temperature gradients, and then amplified by turbulence until equipartition of kinetic and magnetic energy—the coveted turbulent dynamo regime. To test this theory, an international collaboration lead by a team at the University of Oxford is using the most powerful lasers in the world to recreate supernovas that could fit in the palm of your hand. These shockwaves are similar to supernova remnants such as Cassiopeia A located nearby in the Milky Way. Using the invariance of magnetohydrodynamic equations, plasmas in the laboratory can be dynamically similar to plasmas in space (1). A team of researchers used Central Laser Facilities, CLF, Target Area West, TAW, to investigate the turbulent flow of inter-colliding plasmas in an ambient background – laboratory based astrophysics, experiments at STFC’s Rutherford Appleton Laboratory, 29th May 2012. 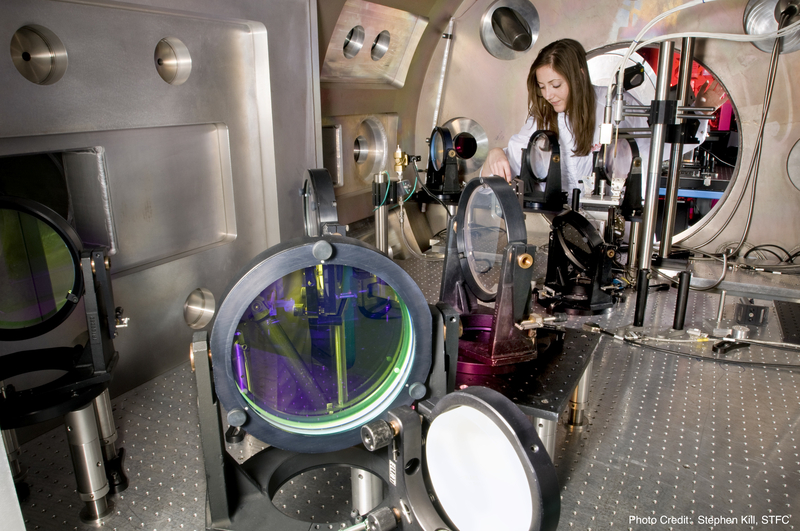 Image shows Jena Meinecke, Oxford University, adjusting optics in the TAW target chamber. Credit: Stephen Kill / STFC. To make a supernova, a carbon rod as thin as a strand of hair was ablated inside an ambient gas-filled chamber with six Vulcan laser beams at the Rutherford Appleton Laboratory, reaching millions of degrees Celsius in a billionth of a second. This exploding material expanded ballistically outwards, generating a shockwave that was observed to create its own primordial magnetic fields (2). To amplify these tiny fields, a plastic grid was placed in the path of the laser-produced shockwave to create a turbulent environment. A similar event occurs in the universe as an expanding supernova encounters dense cloudbanks and becomes chaotically tangled. The team’s experiments have show that induced turbulence can stretch, twist, and fold magnetic fields like a rubber band, resulting in an overall gain in magnetic field strength (3). Due to the high impact of these results, the team’s work has been named one of the Top Ten Breakthroughs of 2014 by Physics World. Most importantly, this demonstrates the incredible role lasers now play in piecing together the story of our universe. Now the collaboration is preparing for experiments using the National Ignition Facility, the largest laser on Earth, to create conditions for turbulent dynamo to develop. 1 – Ryutov, et al. 1999 – ApJ. Similarity Criteria for the Laboratory Simulation of Supernova Hydrodynamics. 2 – Gregori et al. 2012 – Nature. Generation of scaled protogalactic seed magnetic fields in laser-produced shock waves. 3 – Meinecke et al. 2014 – Nature Physics. Turbulent amplification of magnetic fields in laboratory laser-produced shock waves. 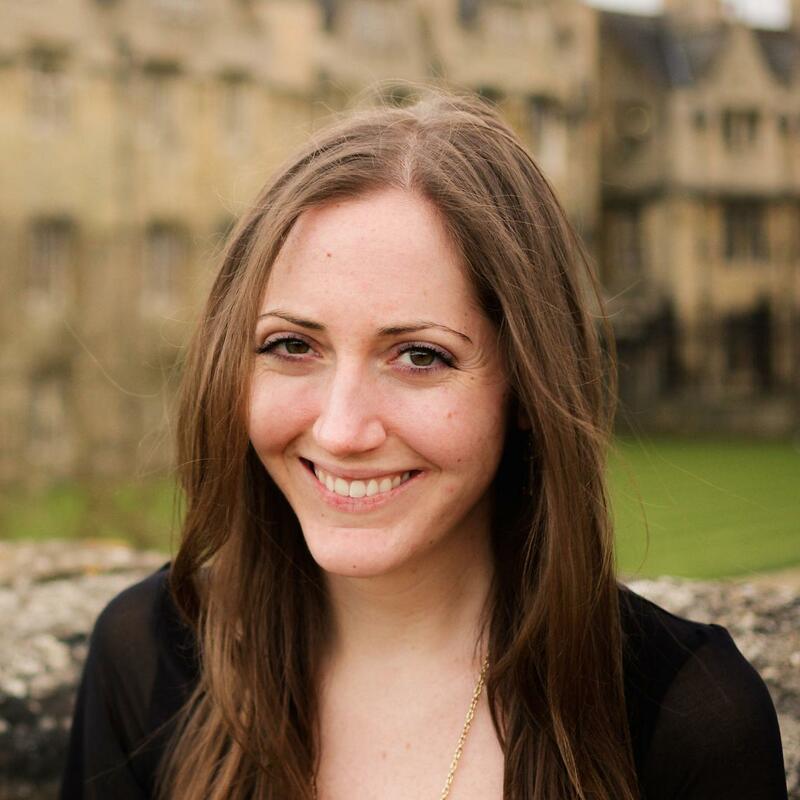 Jena Meinecke is a laboratory astrophysicist studying the origins of magnetic fields. Using high-energy lasers such as the National Ignition Facility (NIF) laser, she recreates astrophysical objects in the laboratory such as supernovas– centimeters rather than parsecs in diameter. This allows her to study phenomena which develops over hundreds, thousands, even millions of years within a few microseconds. In particular, Jena focuses on the generation and amplification of magnetic fields by both the Biermann battery mechanism and turbulence, respectively.